I’m never sure what to say when people ask me what my favorite movie is. I know my TWO favorite movies, but I constantly go back and forth between The Princess Bride and The Goonies. It’s hard to decide. He is from the Halloween Accessory Kit that goes with the Build-a-Banner Simply Created Kit. I immediately saw One-Eyed Willie, the pirate whose treasure the Goonies hunt so they can save their homes from foreclosure. The first Goonie. I knew right away that Willie needs to be on my Halloween banner. So I got out my Witches’ Brew Washi Tape and made him a little bandanna, just by wrapping the washi tape diagonally around the top of his head. 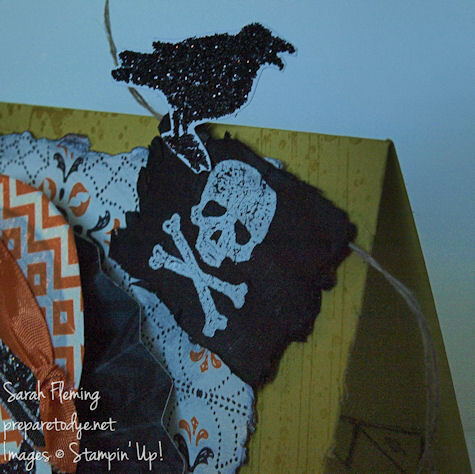 Then I added a piece of the Pumpkin Pie Seam Binding ribbon that comes with the kit. I wrapped it from the back (I glue-dotted the end down on the back of the die cut), then tied a knot in the end and glue-dotted that down on front so it would look like a knotted bandanna. Eeeee! It made me so happy. Then I put some washi tape over his eye, traced around it with a pencil, and then cut out the eye patch with scissors. 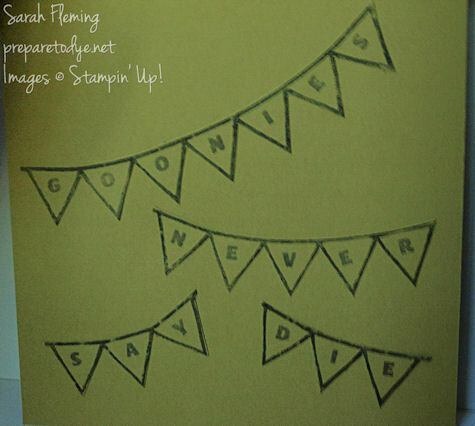 By this point I was giddy and shouting, “Goonies never say die!” in my craft room. [I guess in my case it’s Goonies never say dye. Haha. You know you want to laugh at my bad puns. See, because it’s dye ink that I use. Punny.] 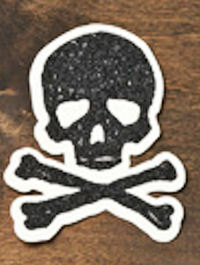 The strap of the eye patch is the black and silver ribbon that comes with the Halloween Accessory Kit. 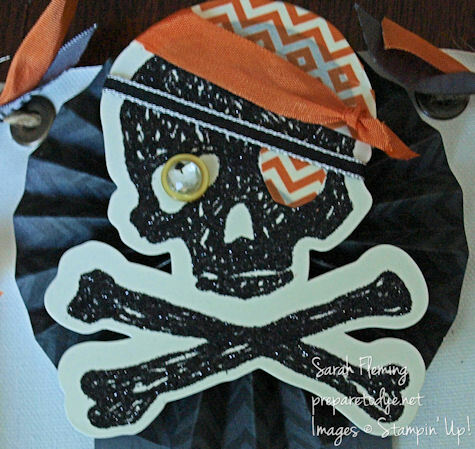 I got the idea for the Large Rhinestone Basic Jewel set in the Summer Starfruit button from the banner sample in the Holiday catalog, and any pirate skeleton needs a jeweled eye! So then I decided that Willie needs to be on a card. And there should be an oblique reference to his ship, The Inferno. Yes, I’ve watched that movie a few hundred times — what gave it away? I decided on a square card base (in Summer Starfruit) to complement the rosette. I distressed it a little using the same color ink and the Gorgeous Grunge stamp set, scissors, and my fingernail. I need some more practice at distressing, but that’s okay. I added the Witches’ Brew paper; for that, I tore the edges, roughed them up a bit with my thumbnail, and sponged on some black StazOn ink. This flag makes me so happy. 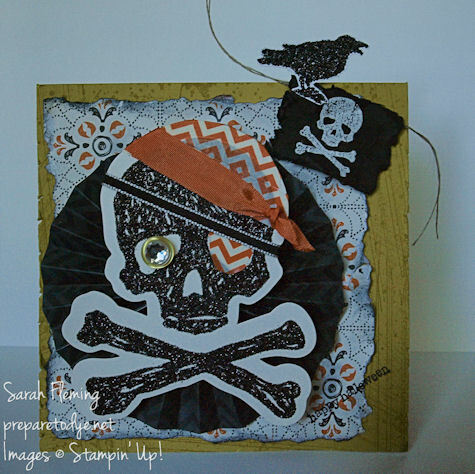 The Toil & Trouble stamp set has this little skull and crossbones. Not laughing like a Jolly Roger, but close enough. And since the stamp is a little sketchy, it already looks like the flag is weathered, even before distressing. I embossed the flag in White on Basic Black cardstock. To give it some age, I crumpled it up several times, then went around the edges with scissors and my trusty thumbnails again. I threw on the Linen Thread, as the rope that would hold the flag. The crow is also from Toil & Trouble; I stamped him in Versamark, then added Heat and Stick Powder — this is basically glue in powdered form, and when you melt it with the Heat Tool, it turns… well, glue-y. Then you sprinkle on your glitter and heat set again with the Heat Tool. 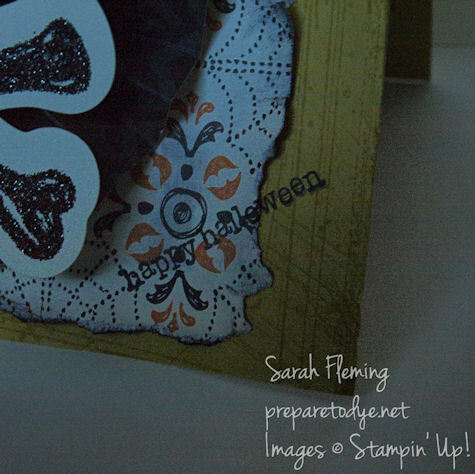 You can find all the products I used to make the card in my online Stampin’ Up! store, 24/7! ← Best thing ever: Pop-up cards! !